We have many leaks pop up this month but as it happens most of them have been confirmed as actual product news. Now, a new addition to that list is the Motorola Droid Tablet, something we have heard conjecture of and seen some photos but there was no actual confirmation, well, until now. The tablet, teased by Verizon in a video earlier this month, where people were expecting the launch of a new Razr smartphone, turns out to be about a Droid Tab. There is a section of this video that most people kind of missed out on. 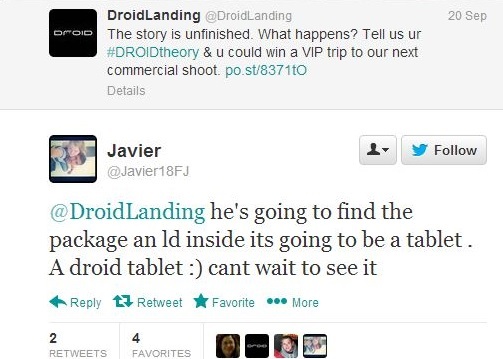 Well, Droid Landing, a Verizon promotional arm points out, along with a freeze frame of the tablet, that the device being talked about is actually a tablet. Here’s a snapshot of their Twitter feed. The biggest confirmation will come when the full video is released next month, but we are more less sure now that we might see a Droid tab in the future.